Bacterial gas. 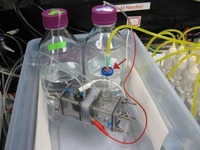 Using a prototype system that uses only fresh water (bottle, left), salt water (right), and a chamber where certain types of energy-generating bacteria feed on nutrients (foreground), scientists have produced hydrogen gas (collected in chamber at arrow) without using any external sources of energy. For the first time, researchers have sustainably produced hydrogen gas, a potential source of clean energy, using only water and bacteria. The challenge now, scientists say, is to scale up the process to provide large amounts of hydrogen for various purposes, such as fueling vehicles or small generators. Hydrogen may be the ultimate clean fuel because burning it—in chemical terms, reacting it with oxygen—yields only water vapor. Previously, researchers have produced hydrogen gas in microbial-powered, batterylike fuel cells, but only when they supplemented the energy produced by the bacteria with electrical energy from external sources—such as that obtained from renewable sources or burning fossil fuels, says Bruce Logan, an environmental engineer at Pennsylvania State University, University Park. Also, by using devices that contain large stretches of permeable membranes that separate salt water from fresh, scientists have tapped the voltage difference that exists between them. But those devices create only a voltage difference; they don't generate the electrical current required to produce hydrogen, Logan notes. Hydrogen atoms are formed in such devices only when electrons flow into a fluid where they can combine with hydrogen ions; those atoms in turn combine with each other to create hydrogen gas. Now, Logan and Penn State environmental engineer Younggy Kim report online this week in the Proceedings of the National Academy of Sciences that they've done something no other team has: They've successfully combined the two types of devices to generate hydrogen without any external sources of energy whatsoever. The prototype device contains two small chambers—one holding the bacteria and their nutrients, the other holding salty water where the hydrogen was produced—that are separated by five stacked cells through which the researchers circulated fresh water and salt water. Together, these stacked cells generated between 0.5 and 0.6 volts—enough, the researchers say, to enable hydrogen production in the microbial fuel cell, in which bacteria feed on acetate compounds. For each 30 milliliters of sodium acetate solution provided for the bacteria, the device generated between 21 and 26 milliliters of hydrogen gas over the course of a day. Admittedly, this is a small volume, about four times the amount of fuel in a disposable lighter, but it's enough to prove that the hydrogen-generating concept works in the lab, the researchers contend. Although the equipment needed to produce the hydrogen is expensive, the device needs no external source of energy—and therefore no greenhouse gases are generated during the process. The team's device "is elegantly simple, and their test results are well-explained and unambiguous," says Leonard Tender, a chemist at the U.S. Naval Research Laboratory in Washington, D.C. One of the challenges to scaling up the process, he notes, will be developing new materials for fuel cell membranes that won't quickly become clogged with the chemical byproducts of bacterial activity, which would cut down on the flow of ions that help maintain the voltage difference across the membranes. Once such hurdles are crossed, however, the process offers the intriguing possibility of using the organic matter in wastewater to generate energy, he notes. But César Torres, a chemical engineer at Arizona State University, Tempe, suggests that the new technology isn't quite ready for full-scale production of hydrogen. "This is a simple process, but the chemistry and the components are complicated," he says. "The technology needed to design and manufacture materials needed to produce efficient, nonclogging membranes is quickly evolving, but there's still a lot of research to be done." Another challenge to scaling up will be "keeping the bacteria happy," he notes. The key, he suggests, will be extracting much but not all the energy produced by the bacteria. Trying to use all of the energy produced by bacterial metabolism wouldn't leave enough for the microbes to grow, reproduce, and thrive.